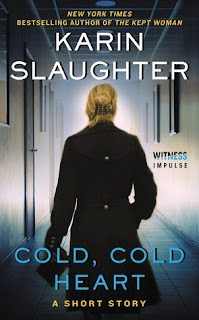 Surprising, suspenseful, and diabolically clever, Cold, Cold Heart offers old fans and new readers alike a taste of the writer Gillian Flynn calls "one of the finest crime novelists at work today." I loved reading this story! The way that Pam was treated by her husband who became her ex, yeah, was truly horrible, and I was rooting for her the whole way through! Of course what she did was shocking, but it was totally awesome! John was awful! Having his family on allowance-including Pam. And when she ran out, not giving her more and berating her for not using it more wisely. And then to bring her to his bedside and do what he did? Yeah, awful! I felt really bad for Pam. She tried to be the strong one after her son died-even though when she brought up the warning signs when he was alive, John brushed them off-and she's the one that suggested he start writing down things to deal with his grief. That turned into a very lucrative book. In which he bashed her. A lot. Not cool, dude! But she got her revenge by tampering with his want to be frozen so he could be brought back in the future! A little complaint that I have is the mention of "their children" in the synopsis. They had a son. One. And he died well before John was diagnosed with cancer. So there wouldn't be any way for their child to be shocked over her actions because he wasn't there. Yeah. Just a little nitpick! Loved reading this story, it was really fantastic! Reason Why: Love her books and writing, and it's a SAC 2016 Book!